JEFFERSON CITY, Mo. (AP) — New Missouri Gov. 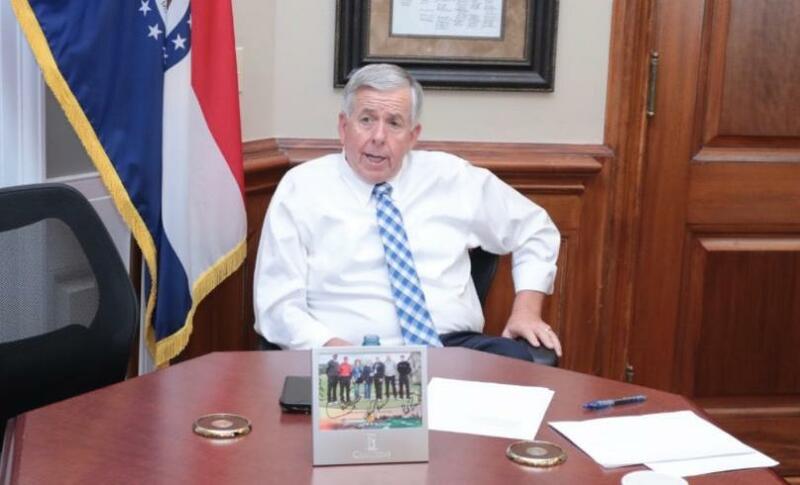 Mike Parson said Monday that he wants to work with the "good team" of cabinet members selected by former Gov. Eric Greitens. Parson, who was lieutenant governor and assumed leadership when Greitens chose to step down Friday rather than continue fighting possible impeachment and allegations of personal and political misconduct, met with cabinet members Monday morning. Parson and Greitens are both Republicans but won office independently of each other. While Greitens was a self-described outsider who pledged to shake up "politics as usual," Parson has served in public office for years as a state lawmaker and then lieutenant governor. Despite their differences, Parson on Monday praised the agency heads picked by Greitens. "Gov. Greitens brought together a good team to the state of Missouri: most of these cabinet members back here that I'm looking forward to working with," he told reporters outside his capitol office, where department heads had gathered. "I don't anticipate any changes in the cabinet that I'm aware of." Those seated in Parson's office Monday morning included directors Anne Precythe of the Department of Corrections and Randall Williams of the health department. Both moved to Missouri from out of state to serve. Keeping the agency leaders appointed by Greitens could bring some continuity to state government despite the shake-up at the top. The cabinet members picked by Greitens have been in place for less than two years following Greitens' January 2017 inauguration. While cabinet heads remain unchanged, Parson has started bringing in new staffers for his office. Former Hermann Republican Rep. Justin Alferman resigned from his seat Monday morning to work for Parson. He said he'll do legislative and budgetary work for the governor's office; he previously served as vice chairman of the House Budget Committee. Republican Secretary of State Jay Ashcroft's former deputy chief of staff Steele Shippy also left to work as Parson's communications director.